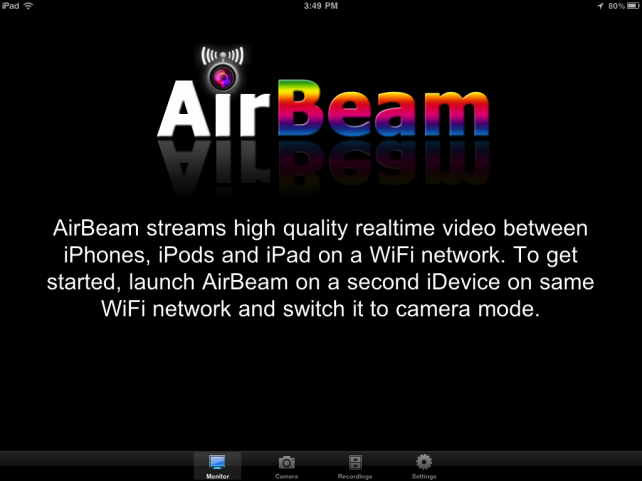 �AirBeam,� a popular video surveillance app for the iPhone, iPad and iPod touch, has recently received an update. Now, users of the app can take advantage of a variety of new features, including audio streaming, audio detection, torch control, a stealth mode and the ability to export recordings to an iOS device�s Camera Roll. Audio streaming and recording: Here it is � AirBeams most wanted feature. Now you can also listen and record remotely what your iDevices hears. Audio detection: Similar to motion detection for video, audio detection can trigger alarms and recording of audio/video. Torch control: Remotely switch the torch on and off during video surveillance (iPhone 4 only). Locked/stealth mode: For audio surveillance, your iDevice can be completely locked now. No one will notice that audio monitoring is active ! Export to camera roll: Recordings can now be exported to your device�s camera roll. Recording to monitor device: Recordings can now be transferred automatically to the monitor device while running. Already, we�ve reviewed the app and liked what we saw. However, now AirBeam has received this update (which its developer notes is �the most amazing update� since the app was released), we�re sure iOS fans will truly enjoy and appreciate the application � provided they�ve got an iOS device to spare! You can download the recently updated AirBeam in the App Store for $3.99. Take a look at it, and be sure to post your thoughts in the comments.